← The Festive Mantle. Just Add Stockings. Forgive my absence. I’m sorting through several bags of clothing that Mrs. E. has inherited. They are her grandparents’ things. It’s safe to say that The Admiral was very well turned out. This entry was posted in Cultivating and tagged jodphurs, riding britches, vintage clothing. Bookmark the permalink. Yes indeed Chris and I can see you down at your favorite shops all decked out!! Tis the Season! I noticed the trousers are cuffed. So I imagine that I would wear a short paddock style boot with them. Crop and tweed jacket are waiting for the right moment. Wow! What an excellent find.They seem to be in great shape. Maybe , they will be usable in some future event. This is a teachable moment for the likes of me. 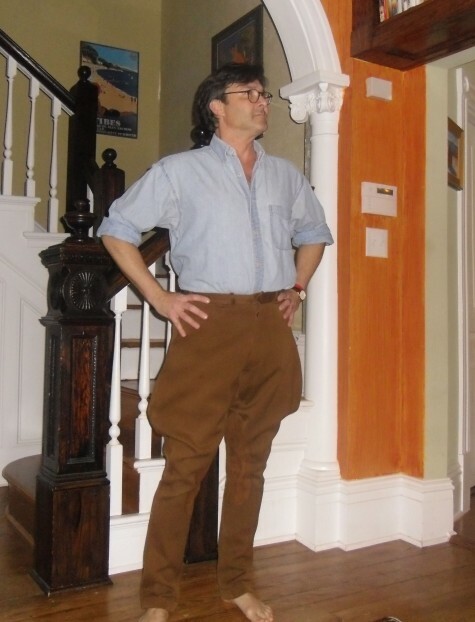 So, I shed my pride, bare my simplicity, and ask the question…not out of sarcasm but because I really do not know and would really like to know: what is the practical impetus for the wide breeches — why they were designed in the first place, so long ago? You see, I believe that almost everything has origins of practicality, necessity is the mother of invention and all that. Because I’m not much more than a cowpoke in a western saddle in northern California, I’m curious, intrigued, and inquisitive. Having outed myself as unschooled on this point of riding breeches, I’m hoping for a payback of knowledge. Thanks in advance. Hi George, The wide design was brought about by the need to move freely in the saddle before the advent of stretch fabrics. These are hunt seat breeches meant to be worn fox hunting, I believe. Mrs. E.’s grandfather was the Naval Attaché to the Embassy in London following WWII. You’re still in need of riding boots, a crop and a tweed jacket! Wish more men to wear such an outfit – I do, of course!